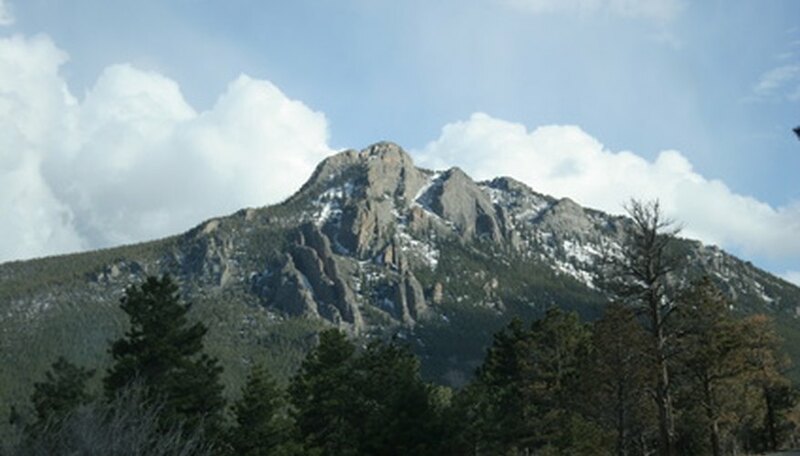 The Rocky Mountains is a well-known mountain range in the Western U.S. and Canada taking up more than 3,000 miles from New Mexico to British Columbia. Millions of tourists flock to the Rockies every year to ski, snowboard and enjoy romantic vacations with one another. Because the Rockies encompass so many states, finding the right romantic resort to spend your vacation in is limited only by your own tastes. Your romantic couples getaway can be in a remote resort with no television or Internet access, or you can stay downtown in a major city and enjoy the mountains and city at the same time. A view of the Rocky Mountains from your hotel room adds to the romance of your romantic winter vacation. Located in the Rocky Mountains of British Columbia, Canada, the Emerald Lake Lodge is nestled between mountain ranges, on the banks of Emerald Lake. The Lodge features 24 cabins along the edge of the lake, none of which have television or Internet access, ensuring that no such distractions interrupt your romantic getaway. All cabins have fireplaces and private balconies, and all rooms are nonsmoking rooms. The Lodge features three restaurants and a lounge where you can share a bottle of wine before retiring to your room for a romantic evening alone. Each restaurant offers a full menu, as well as an extensive wine list and cocktail menu. Wood-burning fireplaces and views of the mountains and lake enhance each restaurant. During the winter you can ski, snowboard and snowshoe. For added romance, Emerald Lake Lodge offers all guests the opportunity to add the “Love Is in the Air” package to any stay, which you must call the concierge to arrange for, and to choose what to include in the package. With its legendary ski areas, such as Snowmass and Buttermilk, Aspen is one the most well-traveled Colorado Rocky Mountain towns. The St. Regis Aspen Resort is a romantic resort for couples, providing mountain views from every guestroom. The Remede Spa offers couples the chance to spend a portion of their getaway being pampered with an aromatherapy bath and a massage while indulging in champagne, chocolate and berries. The restaurant at the St. Regis features an exhibition kitchen, which allows diners to view the chef preparing each meal from the dining room. When you’re not watching the chef you can watch the sunset over the Rockies through floor-to-ceiling windows. When you book your stay, you have the option of including little extras, such as flowers, champagne and chocolates, which will be waiting for you to arrive in your room, adding just a touch of romance to an already romantic getaway. In the Rocky Mountain region of Jackson, Wyoming is the Spring Creek Ranch, a luxury resort offering couples a choice between a room at the inn, a condo or a mountain villa. Each offers views of the Rockies, private baths and luxurious amenities. The Granary restaurant features romantic tables for two next to floor-to-ceiling windows facing where the sun sets each night over the Grand Teton Peak. A spa is located on site and provides couples the opportunity to spend quality time together enjoying a couples spa bath or massage. The concierge is happy to assist you in making dinner reservations or surprising your significant other with a bottle of champagne and chocolates at the end of the evening. During your romantic winter getaway, you can explore the wonders of nearby Yellowstone National Park and enjoy outdoor activities such as skiing and hiking. Romance packages are available upon request when booking your room. If rustic, outdoorsy type getaways don’t fulfill your romantic Rocky Mountain getaway dreams, the Four Seasons is located in downtown Denver near restaurants, museums, shopping and entertainment, all while featuring views of the Rocky Mountains from every guestroom. You still get to enjoy the activities in the Rockies, such as snowboarding and skiing, as well as the comforts of the downtown lifestyle. The Four Seasons dining includes the Edge Steakhouse and Lounge, where you can order your favorite steak and a glass – or bottle – of red wine to enjoy against a background of the skyline of the Rockies. For an extremely romantic dining experience, you can forgo any restaurant at all and spend the evening in your robe while enjoying dinner delivered by room service. The spa offers couples services in shared suites. Within walking distance of the hotel you can enjoy wine bistros, bars, clubs and restaurants when you return to the hotel from your day on the slopes. Raiford, Tiffany. "Romantic Winter Vacations for Couples in the Rockies." Dating Tips - Match.com, https://datingtips.match.com/romantic-winter-vacations-couples-rockies-7782233.html. Accessed 18 April 2019.